It may come as no surprise to my readers that I do not care for Hillary Clinton. She comes off as just slimy and I don’t trust her. And heck, Al Rove may be right and she does have brain damage from a fall in 2012. So it comes as no surprise that Clinton has gone full on gun hate and thinks that WE…the people…are the problem. So our belief in liberty and freedom from tyranny is something that needs to be “reined in.” Interesting. Here are some interesting aspects of Clinton and guns and I ask you, who really is the person that needs to be reined in? As a reminder, one of Silent Hillary’s first actions as secretary of state was to go to Mexico and proclaim – falsely – that 90% of the guns used in drug crimes south of the border come from the United States. This bogus “statistic” was promptly debunked, but Clinton and Obama continued to use it. 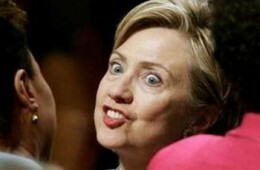 Clinton’s willingness to tout falsified statistics rendered her posture suspect (along with the administration’s) when Operation Fast & Furious was uncovered, and it became widely known that the Obama administration had “walked” guns by the hundreds into the hands of cartel criminals, without coordinating the operation with Mexico, and without following up to track the guns. The House investigation of Fast & Furious naturally focused on the Justice Department, which ran the operation. The investigation has long been stymied by Obama’s invocation of executive privilege. But in October of 2011, Hillary Clinton did testify before the House on at least some of what the State Department knew about Fast & Furious. Another major issue from her tenure at Foggy Bottom was, of course, the UN Arms Trade Treaty, which is intended to restrict the flow of small arms throughout the world, within nations as well as across borders. Hillary and Obama were credited with resurrecting the dormant treaty at the UN in 2009, when they offered U.S. backing for a re-launch of talks on the treaty, as long as the basis for moving forward was consensus by all parties. The treaty’s fortunes were coming to a head in the summer of 2012, only months before the 2012 election, which was not good timing politically. With the Senate urging Obama against any agreement, he and Hillary decided to stall the treaty until after the election. Hillary thus dodged a bullet. Although she had been responsible for resurrecting the treaty as a U.S. priority, she didn’t have to have her name on its passage in the UN or be photographed signing it. Those tasks fell to John Kerry. Suffice it to say, the hatred towards guns that don’t protect or otherwise directly benefit Mrs. Clinton is palpable and has been one of the most enduring constants in her political career. If she ends up with the nomination for President in 2016 do not be fooled when she plays to the middle and claims that she is a believer in the 2nd Amendment. I don’t care how often she is photographed with a shotgun in her hand…its all a lie. It’s what Hil-LIAR-y Clinton does. Hillary: Americans don’t need guns!